Come join us at Tramsheds and Surry Hills as we showcase the last of this season’s amazing truffles from Tasmania. Tagliatelle, parmigiano, cured egg yolk and truffles paired with a glass of prosecco.. do you really need any more convincing? 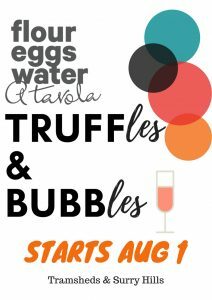 Quantities are now limited so do your taste buds a favour, grab some truffle loving friends and leave the rest to us. Special 2 and 3 course truffle menus available or simply order a la carte. Just make sure you leave space for our limited edition TRUFFLE CREMINO!! !